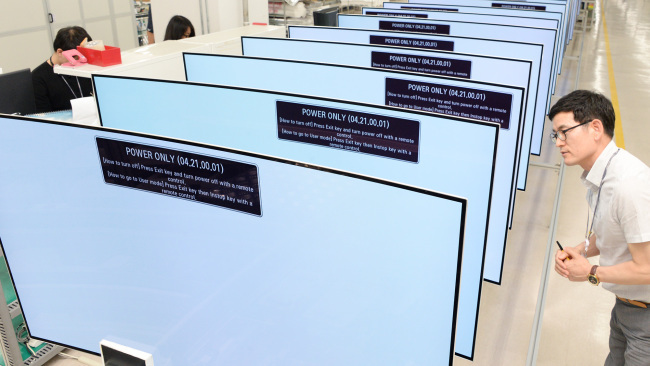 GUMI, North Gyeongsang Province – The loud rattling and fizzing noises of conveyor belts ferrying TV displays along four assembly lines hailed a group of reporters on a visit to tech giant LG Electronics’ A3 factory in Gumi City, North Gyeongsang Province on Friday. In the middle of the 140-meter long conveyer belts, automated robotic arms were tightening screws and assembling the displays -- organic light-emitting diode, light-emitting diode and liquid crystal displays --with circuit boards and plastic back covers. The fully assembled TV products were wrapped and packaged at the end of the lines after passing quality tests. A defective TV set (spotted during the Friday factory tour) was automatically put aside from a conveyor belt for repair. The packaged TV products were piled up in a garage to be delivered locally and abroad to around 50 nations, including Japan and the United Arab Emirates. Workers monitor the organic light-emitting diode TVs along an assembly line at LG Electronics’ A3 factory in Gumi City, North Gyeongssang Province on Friday. The factory serves as the bastion of LGE’s initiative for its OLED TV business. 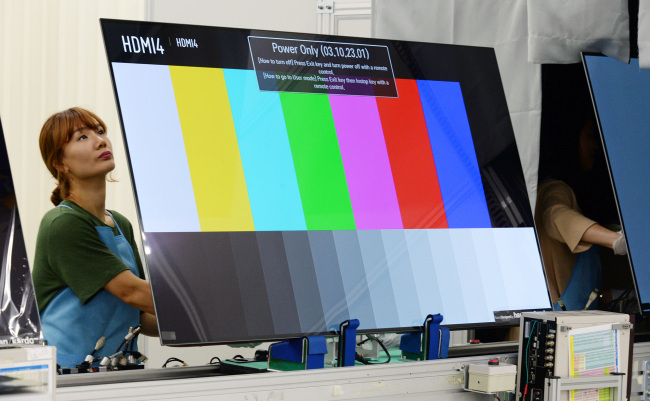 Every new OLED TV technology, including pieces of manufacturing equipment, is first deployed at the A3 factory among the 13 global factories for the OLED TV. The factory is expected to be where foldable and rollable OLED TVs are produced in the near future, potentially outpacing its rivals, including Samsung Electronics. “LGE has been doing research and development for the rollable OLED TVs for years. Even though it is hard to give you the timeline, the company will definitely roll out the product in the near future,” said Lee Byung-chul of LGE’s global production office, adding that the futuristic TV products would be out on the market when the price drops to an affordable level for general consumers. Thanks to the self-luminous nature of the OLED, TVs fitted with the display material do not require a backlight panel. The absence of the backlight panel means there can be fewer layers of panels on the inside of the TV, making it easier to produce see-through and flexible TV sets as compared to LCD TVs. Lee Jeong-seok, vice president of LGE’s home entertainment marketing communication function division said OLED TVs are fundamentally in the top-dog position compared to its LCD counterparts due to its flexibility, and better color contrast and reproduction. LGE and its sister firm LG Display and Samsung Electronics have competitively showcased bendable and rollable displays in recent years, but neither of the companies have commercialized the rollable TV sets so far. Samsung -- the largest OLED display maker for smartphones -- has dropped out of the OLED TV race due to low cost effectiveness. The company is instead focusing on preparing for next-generation TVs such as quantum dot light-emitting diode, or QLED TVs, which do not need a backlight panel and boasts as good picture quality as OLED TVs. The QLED technology, however, is still too immature, according to LGE. “Companies that have announced to push for the commercialization of the QLED TV have not been able to unveil a prototype yet,” the vice president of LGE’s home entertainment marketing communication function division said. “The OLED TV will take the lead in the global premium TV sector for at least the next 10 years,” he added. LGE and LGD have been developing the QLED technology but do not seem to have plans to roll out the QLED TV models anytime soon. Some data also shows that the OLED TV will gain growth momentum despite the dwindling TV market worldwide. Growing 116 percent per year on average in terms of sales from 2013 to 2020, the OLED TV segment will account for 11.4 percent of the entire global TV market in 2020 from 1.1 percent in 2015, according to market research firm IHS.